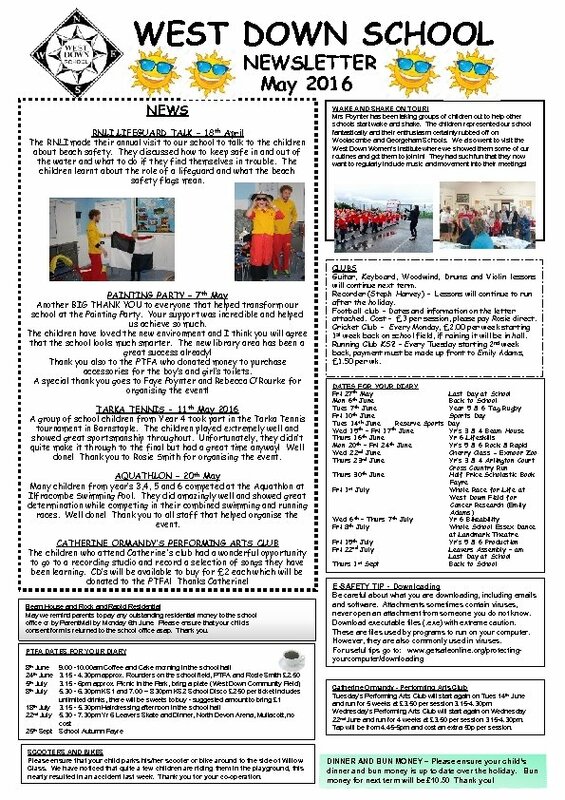 WEST DOWN SCHOOL NEWSLETTER May 2016 NEWS RNLI LIFEGUARD TALK – 18 th April The RNLI made their annual visit to our school to talk to the children about beach safety. They discussed how to keep safe in and out of the water and what to do if they find themselves in trouble. The children learnt about the role of a lifeguard and what the beach safety flags mean. PAINTING PARTY – 7 th May Another BIG THANK YOU to everyone that helped transform our school at the Painting Party. Your support was incredible and helped us achieve so much. The children have loved the new environment and I think you will agree that the school looks much smarter. The new library area has been a great success already! Thank you also to the PTFA who donated money to purchase accessories for the boy’s and girl’s toilets. A special thank you goes to Faye Poynter and Rebecca O’Rourke for organising the event! TARKA TENNIS - 11 th May 2016 A group of school children from Y ear 4 took part in the Tarka Tennis tournament in Barnstaple. The children played extremely well and showed great sportsmanship throughout. Unfortunately, they didn’t quite make it through to the final but had a great time anyway! Well done! Thank you to Rosie Smith for organising the event. AQUATHLON – 20 th May Many children from year’s 3, 4, 5 and 6 competed at the Aquathlon at Ilfracombe Swimming Pool. They did amazingly well and showed great determination while competing in their combined swimming and running races. Well done! Thank you to all staff that helped organise the event. CATHERINE ORMANDY’S PERFORMING ARTS CLUB The children who attend Catherine's club had a wonderful opportunity to go to a recording studio and record a selection of songs they have been learning. CD’s will be available to buy for £ 2 each which will be donated to the PTFA! Thanks Catherine! Beam House and Rock and Rapid Residential May we remind parents to pay any outstanding residential money to the school office or by Parent. Mail by Monday 6 th June. Please ensure that your child’s consent form is returned to the school office asap. Thank you. PTFA DATES FOR YOUR DIARY 8 th June 24 th June 5 th July 8 th July 18 th July 22 nd July 25 th Sept 9. 00 -10. 00 am Coffee and Cake morning in the school hall 3. 15 - 4. 30 pm approx. Rounders on the school field, PTFA and Rosie Smith £ 2. 50 3. 15 - 6 pm approx. Picnic in the Park, bring a plate (West Down Community Field) 5. 30 - 6. 30 pm KS 1 and 7. 00 – 8. 30 pm KS 2 School Disco £ 2. 50 per ticket includes unlimited drinks, there will be sweets to buy - suggested amount to bring £ 1 3. 15 - 5. 30 pm Hairdressing afternoon in the school hall 5. 30 - 7. 30 pm Yr 6 Leavers Skate and Dinner, North Devon Arena, Mullacott, no cost School Autumn Fayre SCOOTERS AND BIKES Please ensure that your child parks his/her scooter or bike around to the side of Willow Class. We have noticed that quite a few children are riding them in the playground, this nearly resulted in an accident last week. Thank you for your co-operation. WAKE AND SHAKE ON TOUR! Mrs Poynter has been taking groups of children out to help other schools start wake and shake. The children represented our school fantastically and their enthusiasm certainly rubbed off on Woolacombe and Georgeham Schools. We also went to visit the West Down Women’s Institute where we showed them some of our routines and got them to join in! They had such fun that they now want to regularly include music and movement into their meetings! CLUBS Guitar, Keyboard, Woodwind, Drums and Violin lessons will continue next term. Recorder (Steph Harvey) – Lessons will continue to run after the holiday. Football club – Dates and information on the letter attached. Cost - £ 3 per session, please pay Rosie direct. Cricket Club – Every Monday, £ 2. 00 per week starting 1 st week back on school field, if raining it will be in hall. Running Club KS 2 – Every Tuesday starting 2 nd week back, payment must be made up front to Emily Adams, £ 1. 50 per wk. DATES FOR YOUR DIARY Fri 27 th May Last Day at School Mon 6 th June Back to School th June Tues 7 Year 5 & 6 Tag Rugby Fri 10 th June Sports Day Tues 14 th June Reserve Sports Day Wed 15 th – Fri 17 th June Yr’s 3 & 4 Beam House Thurs 16 th June Yr 6 Lifeskills Mon 20 th – Fri 24 th June Yr’s 5 & 6 Rock & Rapid Wed 22 nd June Cherry Class - Exmoor Zoo Thurs 23 rd June Yr’s 3 & 4 Arlington Court Cross Country Run Thurs 30 th June Half Price Scholastic Book Fayre st July Fri 1 Whole Race for Life at West Down Field for Cancer Research (Emily Adams) th – Thurs 7 th July Wed 6 Yr 6 Bikeability Fri 8 th July Whole School Essex Dance at Landmark Theatre th July Fri 15 Yr’s 5 & 6 Production nd July Fri 22 Leavers Assembly – am Last Day at School st Sept Thurs 1 Back to School E-SAFETY TIP - Downloading Be careful about what you are downloading, including emails and software. Attachments sometimes contain viruses, never open an attachment from someone you do not know. Download executable files (. exe) with extreme caution. These are files used by programs to run on your computer. However, they are also commonly used in viruses. For useful tips go to: www. getsafeonline. org/protectingyourcomputer/downloading Catherine Ormandy - Performing Arts Club Tuesday’s Performing Arts Club will start again on Tues 14 th June and run for 5 weeks at £ 3. 50 per session 3. 15 -4. 30 pm Wednesday’s Performing Arts Club will start again on Wednesday 22 nd June and run for 4 weeks at £ 3. 50 per session 3. 15 -4. 30 pm. Tap will be from 4. 45 -5 pm and cost an extra 50 p per session. DINNER AND BUN MONEY – Please ensure your child’s dinner and bun money is up to date over the holiday. Bun money for next term will be £ 10. 50 Thank you! ТЕМА: МЕЖБЮДЖЕТНЫ Е ОТНОШЕНИЯ доц. Шмиголь Н.